Ever wondered how to make a Bento Box? Come and join this Japanese themed club. Explore all aspects of Japanese graphic art and skills, creating your own Kawaii piece of graphic art; making origami decorations and gifts; and learning various Bento box and sushi making skills. Join the Steel Band, and learn to play the drums and to read basic music notation. Great choices – which ones will you choose? Click on the image left to download the registration form. Please check the registration forms carefully to see the dates of when there are no clubs. Please remember that all children will need extra water on club days. You may like to also include a small extra snack to be eaten at 3pm before the clubs start. All payments need to be by cash or cheque and should be made in advance, by 9am on Tuesday 9th October. Enrollment is on a first-come, first-served basis. Please note that students are not considered enrolled in clubs until the payment has been received. Last term’s Amazing Animators club was a very busy one! Children arrived each week with a head full of ideas – ready to try to create some old fashioned stop-motion animations! Children learned how taking a series of photos, where the subject is only changed slightly each time, can create the appearance of movement. We tried this technique with flip-book pictures and with Lego models and figures. The results were as fantastic as they were disastrous – apparently this year’s Animators were keen on catastrophe and crashes! Either way, we hope you enjoy the published videos! Choose from an amazing selection of new and popular after-school clubs here at Provo Primary. Magic… Pirate Treasure Maps & Discoveries… Art, Skipping… Board Games… Steel Drums… Homework Club. We hope you will take time to explore what is on offer and encourage your child to try something new or continue taking part in a firm favourite. We also offer tutoring sessions and daily after-school care. The information below outlines all the details of the school clubs we have available this term. Sign up on IsleHelp at school or in the office. At the heart of our ambition for Provo Primary School is our commitment to providing the very best for all children to enjoy and achieve. This includes having the widest possible range of opportunities both within and beyond the curriculum. After-school clubs are a fantastic way of achieving this and we are excited to offer a wide range of clubs, run by teachers, community members and affliated programmes – all with a view to increasing the range of experiences that children have. Activities are designed to be fun and cater for a wide variety of interests and ages. They are open to both Provo Primary students and community children alike. The information below outlines all of the school clubs we have available this term, from Journalism, Science and French, to Soccer and Basketball, Art and Design, along with our affliated Provo Performing Arts School’s Dance and Theatre Arts sessions. We hope you will take time to explore what is on offer and encourage your child to try something new or continue taking part in a firm favourite. Provo Primary Sings, Super Sewing, Let’s visit Europe, Storybook Club, Hockey, Steel Drums and Rugby (with coach Adrian from the TCIRFU). Such amazing choices – which ones will you choose? Click on the image left to download the registration form. Please check the registration forms carefully to see the dates of when there are no clubs and when they finish. Please remember that all children will need extra water on club days. You may like to also include a small extra snack to be eaten at 3pm before the clubs start – especially if they are continuing on to affiliated Provo Performing Art Clubs. All payments need to be made through IsleHelp and should be made in advance, by 9am on Monday 3rd October. Last Saturday morning saw Provo Primary school take part in the Spring Inter-Island U12 tag rugby competition. With tag rugby being such a popular sport on the island and interest from all schools at an all-time high, it was no surprise that Provo Primary could enter two teams: Provo Thunder and Provo Hurricanes. After-school clubs resume on Monday 11th April. Along with our usual favourites that will continue this term, we are pleased to be introducing Super Scientist, Animation, Softball and Field Hockey, and Steel Drums is back! Please remember that all children will need extra water on club days. You may like to also include a small extra snack to be eaten at 3pm before the clubs start – especially if they are continuing on to Provo Performing Art Clubs. All payments need to be made through IsleHelp and should be made in advance, by 9am on Monday 11th April. Clubs end on Friday 17th June. Starting Monday 11th January, we have new and exciting after-school clubs to enjoy, alongside some returning popular ones. With the cooler weather of this term we have a number of sporting clubs on offer. For our younger clubbers we are introducing a ‘Basketball, T-ball and Soccer’ club. For our older children we are re-offering ‘Athletics’, alongside the ever-popular ‘TAG Rugby’ and ‘Soccer’ clubs. Find out more about our new ‘Music and MindUp’ club and how music can stimulate and develop the brain. French and Homework clubs will continue – new members welcome. Click on the image above to see the club schedule. Our Autumn term after-school clubs start on Monday 28th September and will run until Wednesday 2nd December. Along with our usual favourites, we are pleased to be introducing Blogging, Handball, Art Attack, Origami and Construction Club. Click on the image left to see the club schedule. All payments need to be made through IsleHelp and should be made in advance, by 9am on Monday 28th September. NB: There are no clubs during mid term or during parent meeting week. Starting Monday 2oth May, we are pleased to offer new and exciting after-school clubs to enjoy this term for all children from JK through to Year 6, alongside some returning popular ones. For our younger members we have a majestic ‘Be a Princess Club’ and an energetic ‘Adventure Club’. Our ever popular ‘Bit of Everything’ club is also continuing this term. Feeling sporty? Then how about our ‘Soccer’ or ‘TAG Rugby’ clubs. Our new ‘Newspaper Magic’ club will appeal to those who like to solve a problem and be free to be creative. This term is a great opportunity for new members to enrol in ‘Junior / Advanced French‘ Steel Band and Homework clubs too. If you are interested in your child joining us then please download the attached registration form. Check out our Creative Chess Club, Mate! Chess club has been a growing success. With quite a few beginner players, it’s great to see how they are now starting their games with clear opening moves, more carefully thought-out game play and a clearer idea on how to position their pieces to check mate their opponent. Alongside learning and developing their knowledge and strategies, they have also been working in partners to create their very own chess sets – using only paper, glue and tape! A big thank you goes out to our volunteer chess coach, Mr Mark Pankhurst, and Miss Mani for their teaching skills and guidance. We have new and exciting after-school clubs to enjoy this term, alongside some returning popular ones. Feeling sporty? Then how about our ‘TAG Rugby’ or ‘Team Awesome’ clubs. Find out more about our ‘Check Mate’ club and learn to play chess or develop your strategic moves, or take a closer look at our science based ‘Under the Microscope’ club. French, Steel Band and Homework clubs will continue – new members welcome. For our younger members we also have a delicious ‘Edible Treats’ cooking club and our popular ‘Bit of Everything’ club is back. After-school clubs resume on Monday 5th May. Along with our usual favourites, we are pleased to be introducing tap dancing this term and bringing back cheerleading! Enrollment is on a first-come first-served basis and some clubs may be very popular, so be sure to make your choices ASAP. All payments need to be made in advance. Please note that students are not considered enrolled in clubs until the registration form and payment has been received. The TCIFA School Soccer Tournament starts this week. We are entering teams in the Year 3/4 Boys’, Year 5/6 Boys’ and Year 5/6 Girls’ competitions. We anticipate the tournament to be a very positive experience for each of our amazing teams! Please see the updated TCIFA School Competition Schedule to see the game times each week and come and support our school teams. Many thanks again to Casablanca Casino and our Provo Primary PTA for sponsoring our soccer uniforms. We have new and exciting after-school clubs to enjoy this term, alongside many returning popular ones. Feeling sporty? Then how about our ‘Athletics’ or ‘Soccer’ clubs. Or if you fancy a variety of activities, then perhaps our ‘Bit of Everything’ club is for you. Click on the image left to download the registration form. Please check the registration forms for the dates of when there are no clubs and when they finish. You may like to ensure that your child has a small extra snack and extra water on club days. Amazing Animators Release Workout Video! Provo Primary’s Amazing Animators have created a workout video – just in case you feel like some exercise after Thanksgiving or during the upcoming holiday season! This video was created using a technique called retro-scoping, where a video clip is broken down into frames and traced by hand. Each of the individual frames was then photographed and re-animated using MovieMaker. We hope you enjoy our latest video! When Miss Charlotte and her husband enrolled their two children at Provo Primary last year, little did anyone know the school was soon to have an “art attack”! 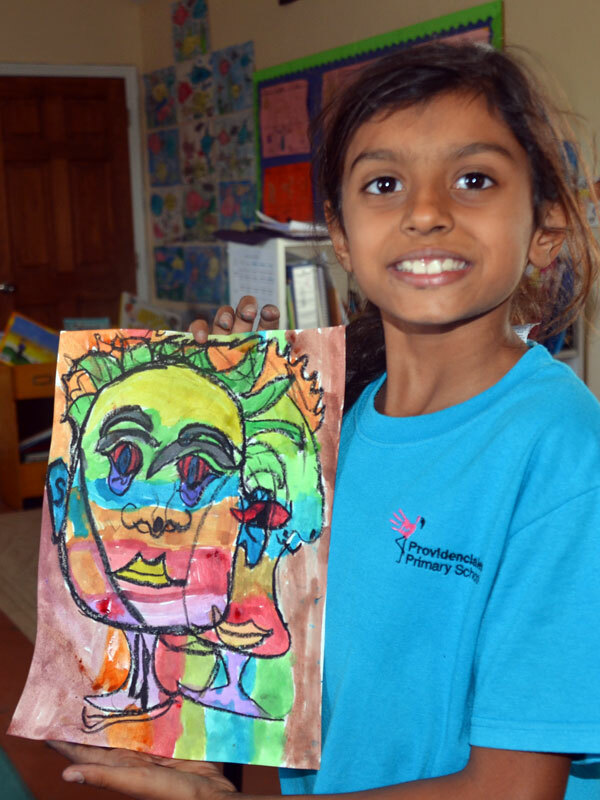 An accomplished professional artist with a graduate degree in higher education art and design from Cambridge University, Charlotte’s initial after-school art club proved so popular, that there are now “junior” and “senior” sections on separate days with projects targeted to the different age ranges. Provo Primary Golf Club a Smash Ht! During September and October the Provo Primary Golf Club was in full swing! Eight pupils were welcomed by our friends at Provo Golf Club for a fantastic five-week golf clinic that aimed to help them with all parts of their game. From chipping contests to putting challenges, longest drive competitions and straight shooting matches, our Golf Club had it all! 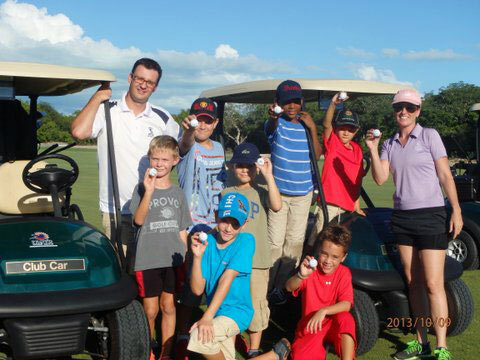 Children were able to learn the basics of the game on the beautiful practice greens and driving range, and were even able to get out onto the course to test their long game on a real fairway. In our final session children used their new-found skills in a hotly-contested competition. Pupils realised that a smooth swing is only part of the recipe needed for a good golf game! In our “Cool as a Cucumber” challenge, children learned that a calm and focused mind was just as important as the club in their hands. A huge congratulations goes out to all of our young golfers, as well as an even bigger thank you for our enthusiastic parent volunteers. And finally a giant thank you to Dave Douglas and the Provo Golf Club. We hope to swing back into action in the summer! FORE! We hope you enjoy these flip animations that were created by our talented animators in our ‘Amazing Animation’ Club. Our additional after-school clubs start Monday 30th September. Click on the image to download your registration form and see all the details! Clubs include Explorers, Cheerleading, Advanced French, Ball Bonanza, Cooking and Amazing Animators. We also have a few spaces available in Homework and Junior and Senior Art clubs. Golf and Steel Drum clubs are currently full. We are also introducing Spanish Club for Junior Kindergarten, Kindergarten and Years 1 and 2, starting Wednesday 23rd October. Steel Drums Art, Golf and Homework Clubs will start next week. Please click on the image to open the registration form. Our full after school clubs will start in the first week of October so look out for details of these exciting new club choices in the next couple of weeks. We are keen to hear about community members who would like to run a club, or assist with one, as a part of our after-school programme. Suggestions for potential clubs you feel your children would enjoy are also most welcome. We have new and exciting after-school clubs to enjoy this term, alongside many returning popular ones. How about our ‘Crazy Contruction’ club or if you fancy staring in a movie, then perhaps ‘Movie Making’ club is for you? Click on the image, left to download the registration form. Please check the registration forms for the finishing dates of each club. You may like to ensure that your child has a small extra snack and drink in their lunch box. We have a wide variety of new and exciting after-school clubs to enjoy this term. Click on the image, left to download the registration form. Please check the registration forms for the dates of each club. Enrolment is on a first-come first-served basis and some clubs may be very popular, so be sure to make your choices ASAP. All payments need to be made in advance. Please note that students are not considered enrolled in clubs until the registration form and payment has been received. Amazing Animators Reveal their First Film! It’s been an exciting couple of weeks in the Provo Primary Animators club! Children have been busy learning the basic skills needed to make an animation and have been working hard together to complete their first films! First, we all learned how important it was to use the cameras correctly, making sure that they don’t move at all during filming. Then we learned the basics of stop-motion animation by filming a growing flower one frame at a time. It takes many, many photos to make even a simple movie! Finally, we all learned how to use Movie Maker, a program that helps us to put all those photos into a beautiful film! We added a title sequence at the start and credits at the end before setting the whole movie to music! We hope you enjoy our first ever movie projects. Click on ‘Read More…’ bring out the popcorn and enjoy! Look out for us at the Oscars!